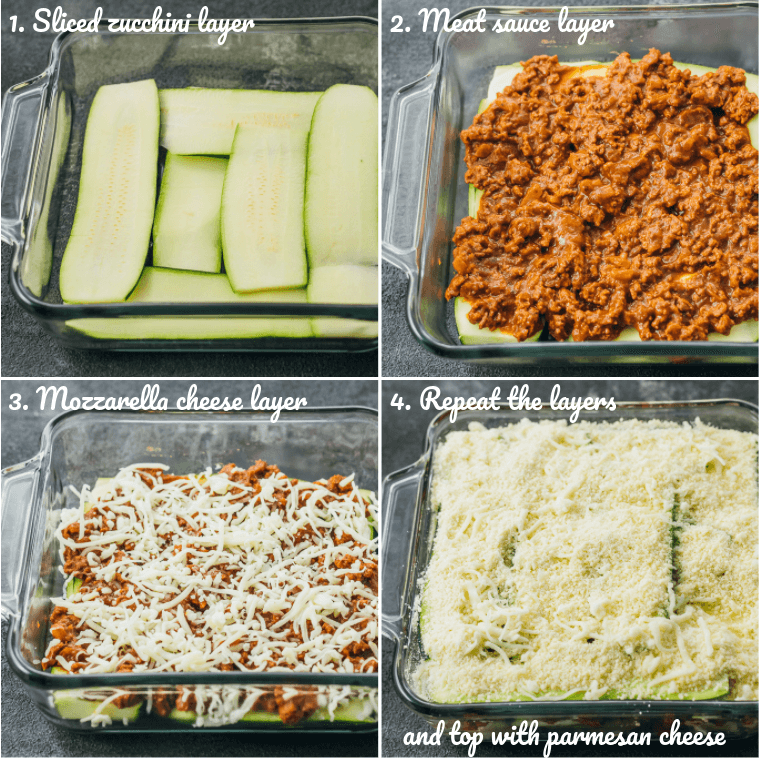 This easy zucchini lasagna is a great low carb and healthy alternative to your typical lasagna. It’s so good that you won’t miss lasagna noodles. This saucy zucchini lasagna is your low carb godsend for times when you’re craving some Italian comfort food. Lasagna noodles are replaced by thin zucchini slices, and you won’t even notice the pasta’s gone. In fact, Mr. Savory Tooth and I like this version a lot better than your typical pasta based lasagna. Most of the flavor is in the sauce itself, so taking away the lasagna noodles doesn’t detract much at all. Speaking of the sauce, that’s the best part of this lasagna: it’s a very savory and hearty meat sauce, full flavored with beef, onions, tomato sauce, oregano, and a pinch of cayenne. 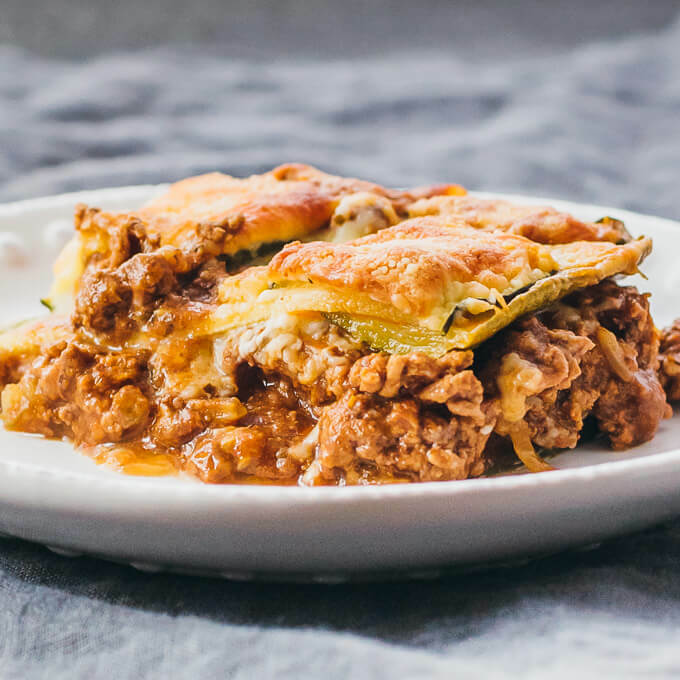 The sauce is roasted with layers of zucchini and mozzarella cheese, making this lasagna so richly flavorful that you’ll want more than one serving — more like two or three. I adapted this zucchini lasagna recipe from a no-bake stovetop skillet lasagna that I made a year ago. I kept the onions, mozzarella cheese, oregano, and cayenne, but swapped out sausage for ground beef (that was a strict order from Mr. Savory Tooth, who abhors sausage) and used tomato sauce instead of crushed tomatoes. There’s no contest here — the flavors and textures in this zucchini lasagna are leagues ahead of my skillet pasta lasagna. If you haven’t tried making zucchini lasagna, I highly recommend that you give it a go. Moisture control is key in any recipe that uses zucchini, which is a very wet vegetable that exudes plenty of liquid during cooking. To combat the moisture so that you don’t end up with a soggy lasagna, some people will salt their zucchini prior to cooking to release some liquid, or grill the sliced zucchini before baking. I don’t have the kind of patience required for either of those things, so I just make sure that my meat sauce is overly thick. 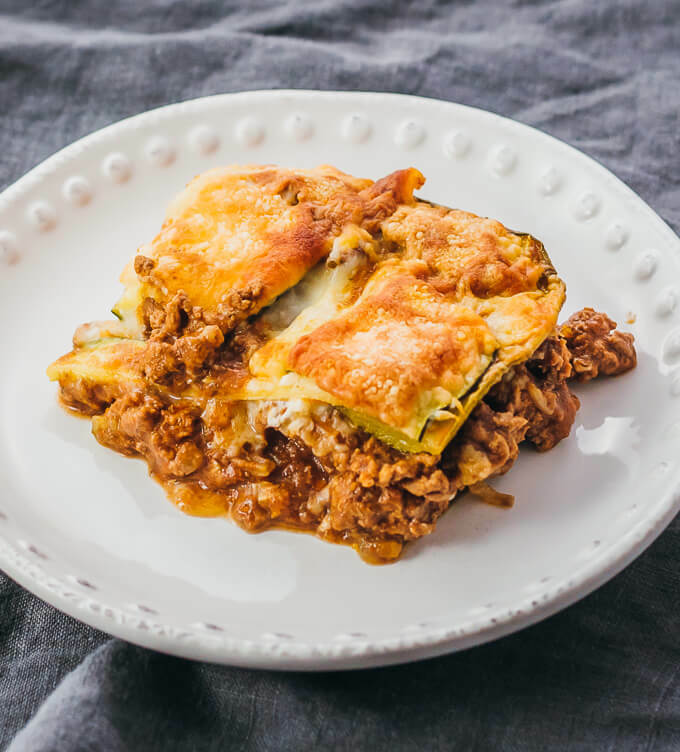 As the zucchini cooks and releases liquid, that provides the moisture needed by the meat sauce to bring all of the lasagna layers together into a cohesive dish. To ensure that your meat sauce is thick, I recommend using tomato puree or tomato sauce. Avoid using thinner tomato mixtures such as diced or crushed tomatoes. When cooking the meat sauce, simmer it long enough that it has time to thicken. What kind of cheese should I use for lasagna? Use a soft and stretchy cheese that melts easily, like mozzarella, jack, or cheddar. You can also use a mix of cheeses, such as mozzarella mixed with another type. How long do I bake the lasagna? You should bake for 45 minutes at 375 F. The top cheese layer should be golden brown and the sides should be bubbling up, indicating that the zucchini layers are cooked and tender. How do I make the lasagna ahead of time? Follow the recipe’s steps for making the meat sauce and assembling the lasagna. Cover and refrigerate the assembled lasagna until ready to bake. The baking time will be longer than specified in the recipe. Have fun with this recipe and experiment with other flavor mix-ins. Perhaps you want to add basil instead of oregano, or garlic instead of onions. You can add your own favorite seasoning mixes to make it your own. 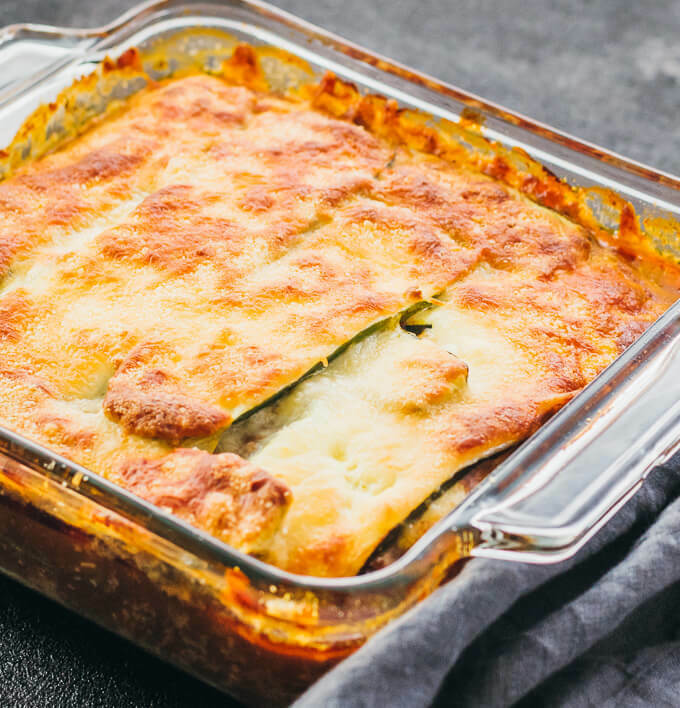 This zucchini lasagna would go great with appetizers such as a chopped Greek salad with avocado dressing or artichokes with balsamic mayo dip. This easy zucchini lasagna is a great low carb and healthy alternative to your typical lasagna. Gluten free and keto friendly. Heat a high-sided pan over medium heat until hot. Add olive oil to coat the bottom of the pan. Add onions and cook until softened, about 5 minutes, stirring occasionally. Add ground beef to the pan, breaking it apart as it cooks. Cook until browned, about 5 minutes. Add tomato sauce, stirring it in. Bring to a simmer over medium-high heat, then gradually reduce the heat to maintain a simmer. Simmer for about 5 minutes to thicken the sauce, stirring occasionally. Add oregano, salt, and cayenne. Stir until well-mixed. Remove from heat and set aside. Preheat the oven to 375 F. Prepare an 8x8 inch baking dish. Slice each zucchini along its length into 1/8 inch thick strips. Arrange zucchini slices along the bottom of the baking dish so that they are slightly overlapping in a criss-cross pattern. Evenly pour about half of the meat sauce over the zucchini. Add about 1/2 cup of mozzarella cheese on top of the meat sauce. Top with remaining zucchini slices. Add another 1/2 cup mozzarella cheese and 1/2 cup parmesan cheese on top of the zucchini. Bake at 375 F until the lasagna is golden brown on top and bubbling, about 45 minutes. Let cool about 10 minutes to allow the lasagna to set and cease bubbling before slicing. This recipe yields 9.5 g net carbs per serving. 0 Response to "ZUCCHINI LASAGNA WITH GROUND BEEF"